Florida Truck Driver Injured in Georgia Gas Station Shooting; Security Failure? Could this violent Carnesville gas station robbery have been prevented, and are justice and compensation available to the victim? Security measures are under scrutiny after a Florida truck driver was shot during a robbery at “[a] gas station and travel plaza” Monday morning, September 24, 2018, according to The AJC. The victim had apparently “just refilled his truck with diesel and ‘offered no resistance, nor posed any threats to the armed intruders'” when they opened fire. He was transported to the hospital with “serious” injuries. 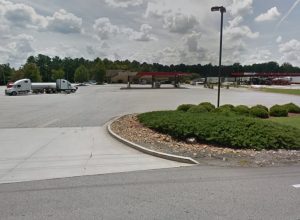 Was negligent security a factor in this senseless Georgia truck stop shooting? Read Our Legal Take below to find out if the victim may have legal avenues for justice and claims for substantial compensation in Georgia. Gas station truck stop patrons have a right to feel safe and secure while on the premises. The Murray Law Firm questions the level of security provided at the property and whether this senseless shooting may have been prevented. Have there been prior incidents of violence on or near property? What security measures, such as metal detectors, clear windows, monitored surveillance cameras, bright lighting, and security patrols, were in place to deter crime and protect the victim at the time of the shooting? By law, property owners in Georgia are required to protect all those legally on the premises from any foreseeable harm. Should the facts of this matter reveal that the gas station owner failed to provide adequate security, the victim may seek justice and elect to pursue legal claims for his injuries.